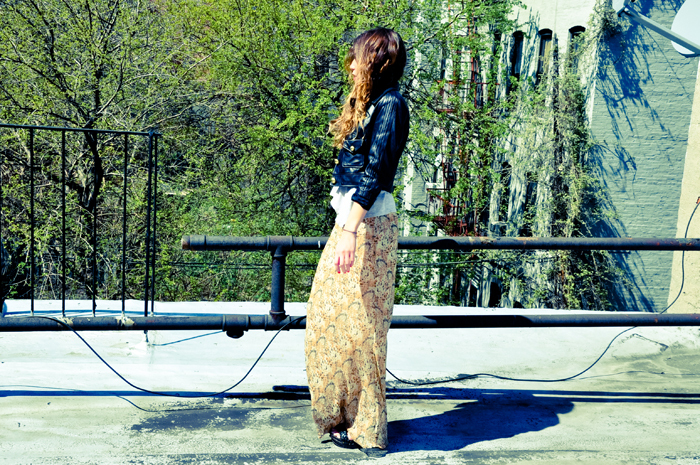 These photos were shot on Micol's roof--one of our favorite places to chill when the weather starts to get warmer. It's an ideal place to bask in the Spring sunshine, as it's sandwiched between two taller buildings, creating a sunny haven without any wind and a little incubator of sorts. Only problem is that to get there you have to scale the narrow fire escape that leads from Micol's deck, past her upstairs neighbors' kitchen, and then up another 10 foot wall. Normally this would be an easy endeavor, but in platform heels and a maxi skirt... well, you can imagine the complications. I was quick to kick off the heels and hike up the skirt after our shoot in order to soak up the last rays of sun while sipping on some wine. Totally worth the effort. sweet jacket Micol! that skirt is so pretty! Beautiful photos! I love the maxi skirt! It might have been treacherous getting up there but it resulted in some amazing pictures! I Love your Style!!! Amazing photos!!! I'm following back on Bloglovin and GFC!! gorgeous pictures :) you have amazing style. OOOOO I love that skirt!!! Beauuutful! Love how you've layered the tee over the skirt! Have a fab weekend dear! So gorgeous! I love this skirt and the jacket looks perfect with it. Love it! Love this, what a great skirt. Thrift stores have THE best maxi skirts! Love this outfit!! Perfect. THis outfit is adorable! I love the maxi skirt!